The Sierras live up to the hype. Lar and I both agree that, in the past eleven days, we’ve encountered the grandest scenery we’ve ever seen, and likely ever will see. There’s a humbling beauty and, at times, a sheer awesomeness up there that’s difficult to describe. I can understand how this territory, along with others like it, has inspired generations of mountaineers, and why the allegiances of those who know it well are so loyal. We opted to carry eleven days of food out of Kennedy Meadows. 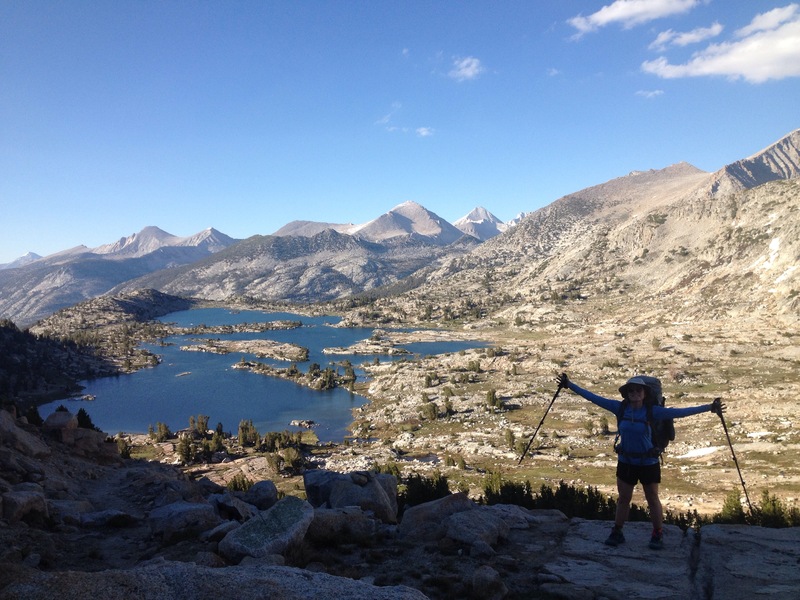 With heavy packs and high altitude our daily mileage dropped significantly, but this had the effect of forcing us to more deeply savor our surroundings. And what a contrast to the desert: almost immediately we were surrounded by rivers, streams, even lakes. 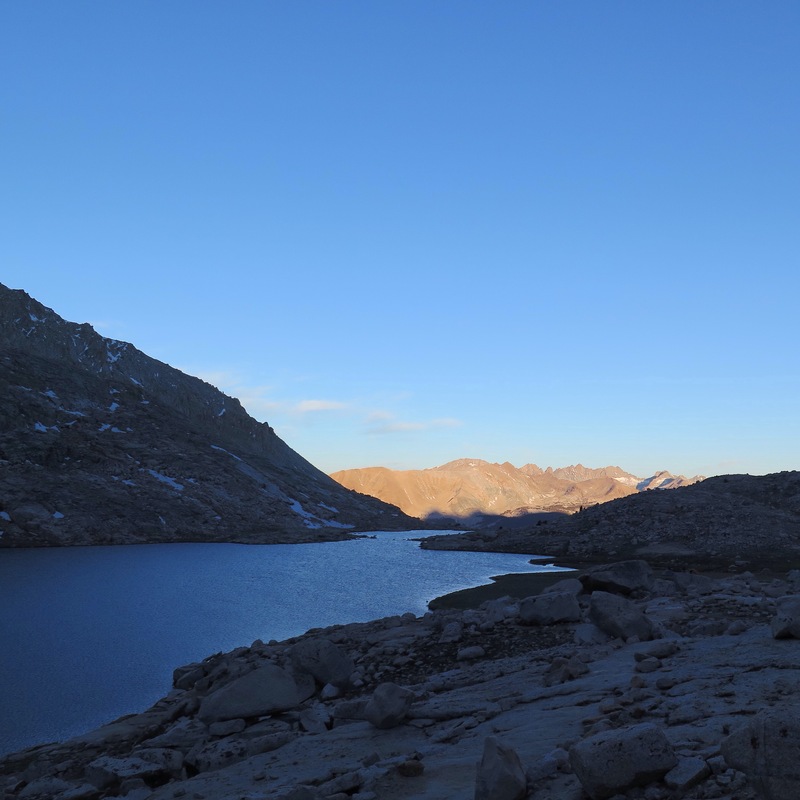 It’s a record dry year for California, but nearly every source listed was flowing up high. We spent the first few days meandering through meadows, dodging spot thunderstorms, and smiling. A few nights in we camped at Chicken Spring Lake, a gem with a large rock wall jutting out from the water. The next morning we crossed into Sequoia and Kings Canyon National Parks and entered another world. For us East Coasters, this place felt like a best-kept secret. 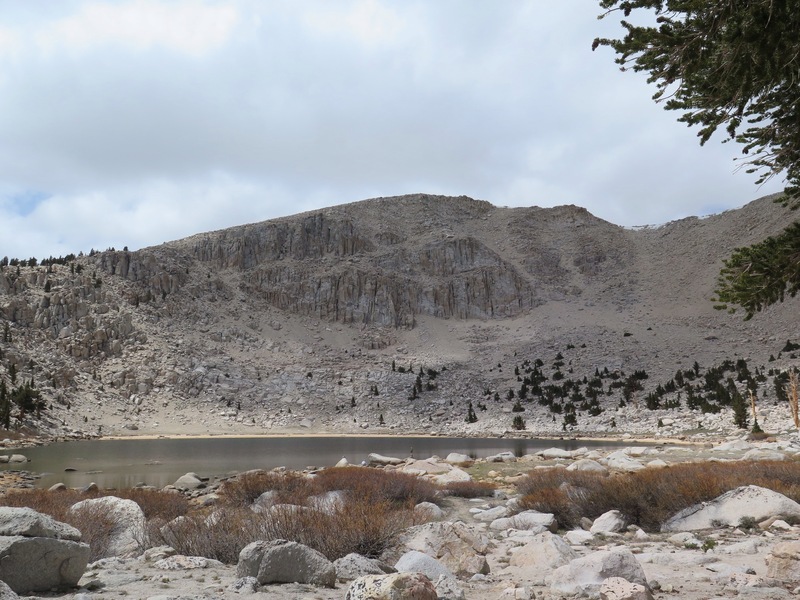 Our days became focused on high mountain passes – Forester, Glen, Pinchot, Mather, Muir, Selden – which were more technical than the smooth desert hiking we were used to. We climbed most of them in some kind of weather, usually hail or rain, and navigated what (relatively) little snow remained on the backsides. 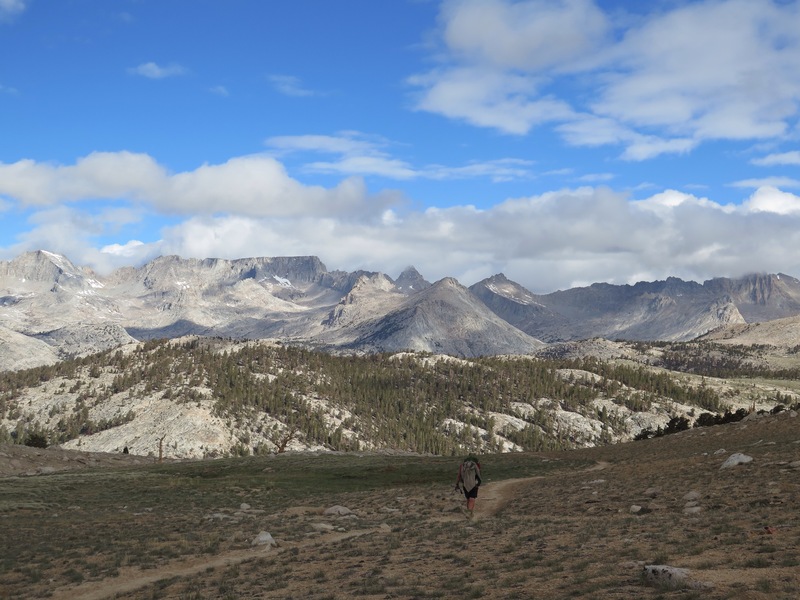 Most of the passes hovered around 12,000 feet, with Forester pass topping out at 13,200 (the highest point on the PCT) and Mt. Whitney, the tallest peak in the continental U.S. bringing us to 14,505 (we summited as a side trip, because, common, you’re right there!). At those heights the landscape becomes pretty stark and imposing. We camped most nights below treeline, where we still woke up with frost on our tent, even in June. 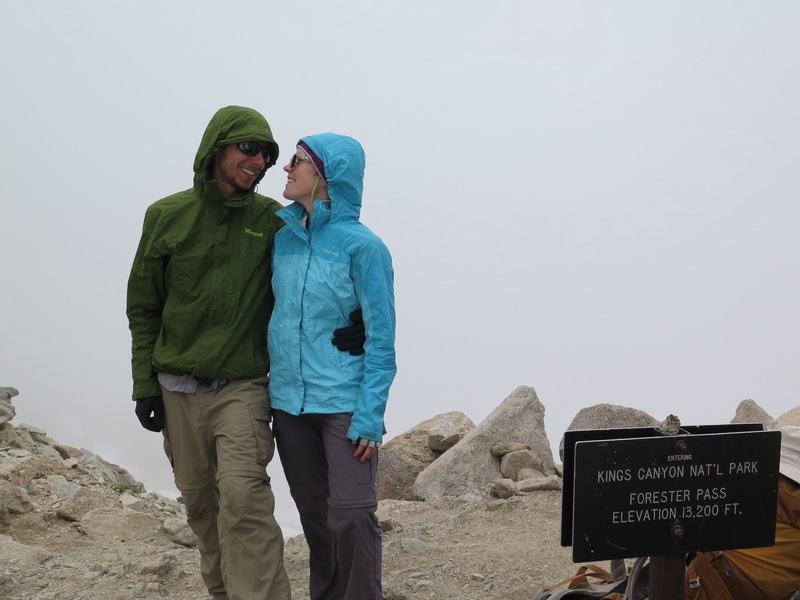 The temperamental mountain weather kept us on our toes and always looking over our shoulders. We’d be sweating at noon, snowed on at 3:00, and drenched by rains in the evening. 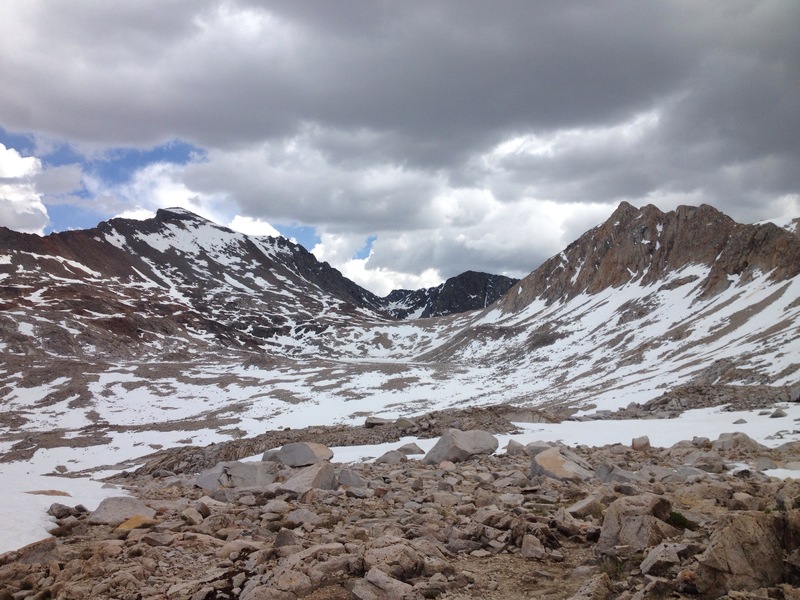 One harrowing thunderstorm caught us descending Muir pass, which has a long and gradual slope. We sang aloud as the sky became entirely dark gray and booming (like, BOOMING) thunder bounced off the mountains. Sitting on our packs in a small grove of trees, we saw hail destroy the surface of a lake like a million marbles in a bathtub. I was scared, but I was a respectful kind of scared. More like a recognition of being very small in a land that’s very big.